We at Puzzazz believe that the entire puzzling community -- authors and solvers alike -- benefit by having a stronger ecosystem. Authors are more rewarded and solvers get better puzzles, and we are happy to partner with folks in the community who are creating great content. One such group is the American Values Club (avxwords.com) which is creating fun, hip, cutting-edge crosswords every week. The A.V. crossword is a reincarnation of the beloved but now dead Onion A.V. Club crossword. It features work by Brendan Emmett Quigley, Aimee Lucido, Byron Walden, Zoe Wheeler, Caleb Madison, Ben Tausig, Tyler Hinman, Francis Heaney, Anna Shechtman, Matt Jones, and Deb Amlen. We are thrilled to tell you that one of the puzzles in the Year of Puzzles will be a special crossover with the American Values crossword, which we're sure that solvers on both sides will enjoy. 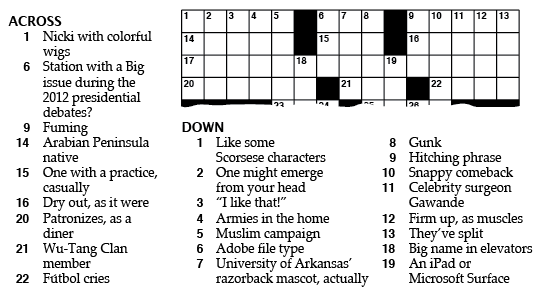 To whet your appetite, here's part of an A.V.-style crossword created by editor Ben Tausig. We're not sure what happened to the rest of the puzzle, but you're looking for the 3-word phrase that goes at 17 Across. We try to avoid obscure words. For example, you do not need to memorize the list of allowed 2-letter words in the Official Scrabble Players Dictionary. The palindromic puzzle's answer is also a palindrome. @Kenneth: Don't worry about spoiling anything. 26-Across (if it hadn't been cut off) would be a valid crossword entry, but not a dictionary word. We take puzzle consistency and accuracy seriously around here :) But we're still human, so I won't guarantee that we'll never mess up. Hm. I know it's torn-off and technically irrelevant, but 25-across seems like it's wrong? i.e. No possible letter in the "26" spot could possibly make it a word?